Show History → The Coin Vault's 30th Anniversary Silver Eagle Red Book Special! 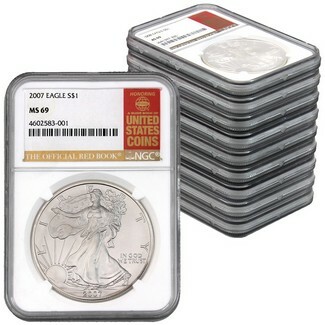 The Coin Vault's 30th Anniversary Silver Eagle Red Book Special! In this special release NGC in collaboration with Whitman Publishing, we have the Mint State Silver Eagle releases from (2007 through 2016) with each coin certified in MS69 condition. This 10 coin set arrives in a Red NGC storage box, and each holder has a special Red Book Label.